Grandad had built his own greenhouse near his bungalow for growing the first stage of plant seedling from seed. Seed had to be sown into small boxes filled with soil that had been sterilised. This stage of the celery plant was a big risk because if this failed for whatever reason then no celery crop would be produced that year. I can’t remember grandad ever having a total disaster but I do recall him having his small seedling plants grown by someone near Whittlesey. His tractor and trailer would be driven to the supplier, loaded with the boxes of celery seedling plants and brought back to Common Lane. It was important for the soil of the ‘beds’ to be light and fine to work with and so the final preparation was for the area to be ‘rotavated’ and then finally raked and worked into beds. The seedling bed area would be marked out with binding string and some eight or ten women would ‘prick out’ the small plants into rows about five inches apart the small trench being made by a small thin piece of metal about six to eight inches long and about four inches deep. The width of the beds was about six feet wide and the women would have a flat wooden board structure the width of the beds and about three feet wide which layed on top of the soil. Some sort of cushion would be layed on top of the wooden structure, a wide home-made cushion or a sack filled with straw and used for kneeling on. I guess the wooden board structure would help firm the fine soil in preparation for making the trench in which the small seedlings where placed. During windy periods the small seedlings when placed in the trench, if not protected, would be blown out of line, so wind-breaks called ‘shelters’ were made. The shelter was a wooden frame about five to six feet high and six or seven feet in width, a central wooden bar, and covered with sacking. These were then affixed in the path at the side of the bed next to where the woman was planting the seedlings. The beds of seedlings would then be regularly watered and after a few weeks, when the plants were about six to eight inches high, they would be dug up, the soil knocked from the root and placed in wooden boxes, these boxes were about three foot long, two feet wide. These were then transported by tractor and trailer to the field where they were planted into a trench about eight or nine inches apart. A hole was made with what was called a ‘dib’ and the small celery plant placed in the hole and firmed in. As the plants started to grow they were ‘balked up’ by a specially designed furrowed board implement pulled along up the rows by the tractor. This moved soil to the side of the plant and this was repeated again later during the growing period keeping the plant covered with soil which helped the celery stalks to bleach white until the plant was finally ready for lifting. Again a specially designed piece of machinery with a cutting blade on a curved arm was pulled up the rows by the tractor and this cut through the bottom of the root and at the same time lifted the celery plant. The mature plant was then individually topped and tailed by the farmhand and tied into bundles ready to be transported to market. Grandad’s small plants from the celery beds found there ways sometimes to local growers such as Shropshire’s, now the largest celery grower and salad grower in the UK. One of grandad Ally’s pride and joy was a stuffed pike which was originally in the house of Noah Legge on the Ferry Bank Road. When Noah died grandad became the stuffed pike’s owner. The pike’s weight was recorded in the Casing as being 36 and a quarter pounds, a somewhat large monster from the river Great Ouse in anyone’s reckoning. The story goes that one of the Legge’s caught this pike in a ‘bow net’ somewhere near the old Ferry Boat pub. The pike was said to have been taken home and the person who caught it said he was going to ‘pan it’, that is fry it and eat it. However, this course of action was prevented and the pike was eventually taken to a taxidermist for preparation and casing. The case became a bit worse for wears so one day the pike in its case was put into the back of my little grey minivan, and grandad and I took it to a taxidermist who lived close to Ely Cathedral. The pike was given a good overhaul and re-cased to its former glory. 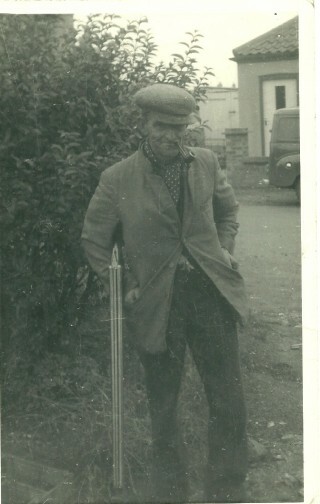 I believe the cased pike is still in the Legge family to this day, together with grandad’s guns. I eventually let my grandad’s grandson have these for his collection of Grandad Ally’s memorabilia. Grandad would occasionally enjoy singing a song or two in the evenings, sitting in his arm chair he would tilt his head backward, close his eyes and start to sing one of his favourite songs. I remember that some of his favourite songs were, ‘I’ll take you home again Kathleen’, ‘The Rose of Traillie’, ‘Colway Bay’, which started, ‘if you ever go across the sea to Ireland, it may be at the closing of the day’, and of course, ‘When Irish eyes are smiling’.